A program of Leadership Jacksonville, Inc. Created in 1989, this year-long program brings together a select and diverse cross section of Northeast Florida’s high school students, with demonstrated leadership ability, and prepares them to become ethical leaders committed to active community involvement. 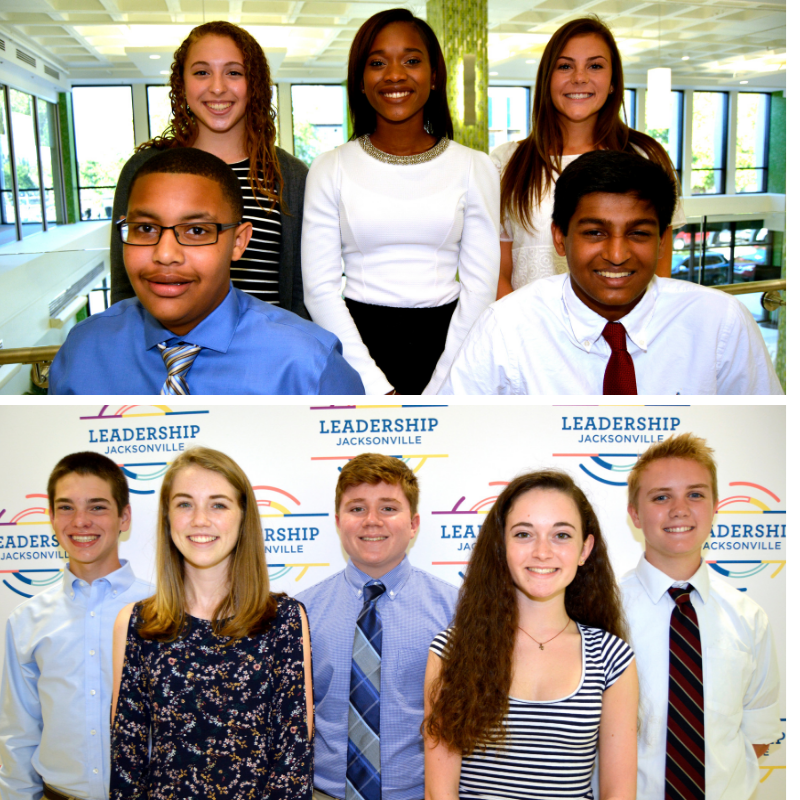 Youth Leadership Jacksonville draws together approximately fifty-four students each year. During this exciting program, students attend an Opening Retreat, six Program Days (one per month) and a Closing Retreat. Programs are practical in nature with hands-on activities. Program Days deal with specific facets of the community such as government, criminal justice, human services, diversity and business. Each day combines a behind-the-scenes experience with a great deal of interaction with the appropriate community leaders. Attend a participating SACS (Southern Association of Colleges and Schools) accredited high school in Duval, Clay, or St. Johns County. High school freshmen from participating high schools will be eligible to apply for participation during their sophomore year. Be approved by the high school principal. Demonstrate proven leadership ability in school and/or community activities. Have an interest in addressing the issues confronting the First Coast communities. Commit to full participation in the program. Be academically sound. An average of “B” or better is recommended. The program will require students to miss seven days of class (one per month). How will the class be selected? Students nominated by participating high schools go through a thorough selection process involving a written application and interview. Nominations for YLJ can only be submitted by authorized personnel at participating high schools and not through this website. Applications will be provided to the participating schools in early November 2018. Contact Meg Folds at meg@leadershipjax.org to find the contact person at a particular school. Students fill out the written application that is returned to their school before the school’s deadline. The school submits its candidates to Leadership Jacksonville in January. Interviews take place February through March, with the class selection complete by May 1 each year. The forty participating SACS accredited high schools in Baker, Clay, Duval and St. John’s counties are eligible to submit applications. Applications are accepted only from these schools. Each participating high school will have the opportunity to nominate four to six freshmen. Teams of Leadership Jacksonville alumni interview all candidates and select the class in the spring. Selected students will participate in Youth Leadership Jacksonville with other selected students during their sophomore year. To meet students from all areas of the First Coast Community and to develop mutual trust and respect for each other. To have an increased awareness of our community needs, opportunities, problems and resources. To gain a greater understanding of contemporary issues through interaction and problem solving with peers, adult leaders and decision makers from all segments of the community. To develop effective styles of leadership, communication and decision making skills. To become a responsible, ethical leader committed to active community involvement. The lessons I learned about life, our community and society in general are things that cannot be learned inside the classroom, but only through the many hands-on experiences YLJ provides.